Rodchenko’s research into the concept of line was fundamental to the ambitions of Russian constructivism. 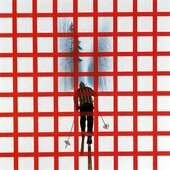 Careful examination of his paintings and objects from 1918 to 1921 show both the experimentalism and the hesitations that accompanied his move from construction to production art. 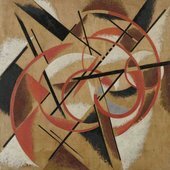 Based on the 2009 Tate Modern exhibition Rodchenko and Popova: Defining Constructivism, the article reflects on the successes and limitations of Rodchenko’s experiment. 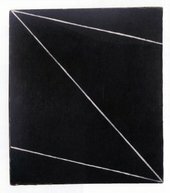 Some time around the middle of 1920 the Russian artist Aleksandr Rodchenko produced a remarkable work consisting of a zig-zag white line painted on a black ground and measuring some 58 by 51 centimetres (fig.1). Whether we describe the zig-zag as one line or three will remain for the moment moot. The painting’s monochrome ground lacks any texture, but creates a depth behind the zig-zag, which therefore comes to lie in, or on, the picture surface. Titled by the artist Construction No. 126, the painting raises difficult questions about Rodchenko’s struggle in these years to transcend the bourgeois aesthetics of the past and to meet what he took to be the demands of the new revolutionary life. How did he manage that transition, and how successful was he in refashioning art as a technical, experimental activity, in tune with the Communist reorganisation of the country? Everything we know about Construction No. 126 leads us to say that it embodies some kind of technical standard, since quite visibly the lines have been painted in oil paint against one edge of a piece of card or flexible wood, perhaps a wooden ruler. Simple inspection of the painting can tell us that two of its three lines are slightly bent towards one end, and no doubt further investigation will be able to establish whether the bendiness is the same in each case. It is also obvious that each of the three lines must have been painted alone, then allowed to dry before the next one was painted (though the two shorter ones could have been painted in quick succession with the diagonal one completed later). If what we see is a single zig-zag line, however, it will almost certainly seem to run in a particular direction, from left edge to lower right corner, then up the diagonal to the top-left corner, and from there to a point on the right edge. The four end-points are significant too. While two of them occupy corners, and are hence determined by the shape and proportions of the canvas, the two others seem to occupy an arbitrary position determined by the inclination of the lines and an intuitive idea of balance within the structure as a whole. This is to say that the corner-points are structural, while the edge-points are probably not – or are very difficult to see in that way. Again, if we take seriously the work’s title, Construction No. 126, we may prefer to see not a single line but three solid components, each formed independently and looking like tensile rods within an enclosing box-like frame – but in that case we must give up the impression of an energetic path travelling across a dark pictorial field. So it begins to matter whether the word Construction offers the suggestion of a three-dimensional thing made up out of three components, or a purely planar path lying on, or in, the two dimensions of the picture surface. Can the viewer really have it both ways at once? Can the artist? It now seems clear that the very nature of line was a major philosophical and artistic problem for Rodchenko. We know that before Construction No. 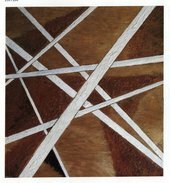 126 was painted he had been working on a theoretical statement to be called Liniizm (‘Line-ism’ or ‘Linearism’), in which the whole immensely complex problem could be addressed. He had already completed a set of linear paintings the previous year. The Russian art-historian Margarita Tupitsyn has recently urged the importance of the fact that Rodchenko was at that time immersed in an ever-sharpening dispute with Wassily Kandinsky, in his whose apartment Rodchenko and his partner Varvara Stepanova had been living since the early part of 1919, and who had analysed the phenomenon of line in a text of his own published in February.1 By all accounts, that text had been read with mounting resistance by the Rodchenko-Stepanova pair. Kandinsky, the more senior artist, had approached the phenomenon of line in a characteristically romantic and mystical way. Beginning with a singular graphic point and what he calls its ‘inner essence’ or its ‘inner sound’, Kandinsky had proposed that, when freed from practical use – as in the placing of the full-stop – singular points naturally extend to straight lines, then to planes, to curves, and from there one can derive ‘the entire resources of a whole realm of art’. In the first instance the straight line moves in various directions relative to other straight lines, meeting to form planes that retain a certain ‘rigid’ geometry. Kandinsky was surely thinking here of Liubov Popova’s now celebrated Painterly Architectonics of 1918 that are constructed of interacting rhomboidal colour-planes, defined by sharp edges, that seldom admit of circular or curving forms. But to Kandinsky even the rhomboidal plane was a limited and primitive form, one from which the artist needs to escape, especially in as much as it involves the use of ‘that most primitive of instruments, the ruler’. Only when ruler and compass are put aside will the straight line quickly escape every mechanical effort to contain it and find a ‘truly infinite number of means of expression’, predominantly curved and colour-rich, that transcend musical categories, even emotional ones, achieving qualities at once inimitable and fine, beyond words, those of what he calls ‘pure art’.2 Kandinsky’s vibrant and swirling Compositions of the period are the practical results of this thinking. And yet at the very moment Kandinsky’s statement was being published in February 1919, Rodchenko was grappling with theoretical and practical issues of his own. What is slightly puzzling in retrospect is that he, Rodchenko, had already successfully negotiated the interplay of line and volumetric construction, having built one series of three-dimensional Spatial Constructions out of cardboard in 1918 (fig.2). Back in the revolutionary year of 1917 he had ‘introduced spatial sharpness in painting through the introduction of lines as cuts into the surface plane’, as he later described his paintings of that time.3 For those works, ‘cuts’ is indeed the perfect word for the carefully painted slices into the matter of the plane, made to look as if a fissure or flap had been created in visual space (fig.3). By the spring of 1919 he was also working on some sketches for architectural schemes combining volumes in space in the context of his membership of the Zhivskulptark (Painting-Sculpture-Architecture) group. Why then was he preoccupied with lines and linear painting in that year? The answer may be found in a set of works he had produced for the 10th State Exhibition that had opened back in January 1919, and that had brought into focus another and very different rivalry, this time with Kasimir Malevich. ‘Long live free colour and tone!’ Rodchenko had written as he prepared a group of works from which colour itself had been finally expunged, all the more effectively to concentrate the viewer’s responses upon density, thickness, and luminosity, the elements, as he saw them then, of planar articulation absolutely freed from descriptive function. Known within the Russian avant-garde as faktura, such qualities were considered pre-eminent among the self-defining mechanisms of the visual arts. Rodchenko’s sudden turn from the faktura of densely-painted black monochromes to a programmatically linear painting style in the spring of 1919 hence becomes a moment of some significance. While Kandinsky is positioning the straight line theoretically as ‘primitive’, Rodchenko is noting the exact opposite in his diary. ‘Thought of painting ten pieces, just black on white, with a ruler’, he writes in July 1919. ‘It would be exceptionally new. I really need to apply myself to the ruler, claim it as my own’.4 Indeed, it is within this group that we find for the first time painted lines as such; no longer cuts in the plane, nor planar edges, but straight and nearly parallel lines grouped in any number from three up to about seventeen (fig.4). These lines possess an even thickness, grouped fan-wise or gridded, hovering above a monochrome ground, typically ochre, reddish ochre, or green. Groups of lines that overlap one another may be said to form a pattern more like a trellis than a grid. Thanks to new technical research by Maria Kokkori of the Courtauld Institute of Art in London, we can be sure that these lines were also painted with fairly dry paint against the side of a ruler or card, sometimes completed fairly quickly to judge by the smudging that is visible where the drying has not been allowed to finish (fig.5). ‘The surface plane is, logically, being discarded, and so as to express constructedness, architecturalness in composition – and there being no further need for it – that old favourite of painting, faktura, is being discarded too’; so wrote Rodchenko in a notebook entry of the time.5 Above all, he begins to talk about his ‘laboratory’, while producing paintings that partake at least metaphorically in the spirit and enterprise of science.6 Yet we also know from Dr Kokkori’s research that there is no under-drawing to the paintings and that Rodchenko’s geometry is to that extent intuitive rather than measured or in any way exact. It is certainly not Pythagorean. Here, it would seem that the conceptual problem of lines – just what they are and how to use them – is now raw and even brutally exposed. Another description would be that, unlike the ‘cuts’ of the previous two years, the 1919 lines have a directional energy that gives them tension and force, as if they flow from one end to the other, often in the direction in which they were painted, where it can be judged from information available to the eye. If this is so, then lines without descriptive function have become complex to the understanding and particularly as to their visual and structural functions in the work of art. Did surface line define a two- or a three-dimensional thing? Are surface lines conceptual, or must they also announce a depiction of some sort? Must they belong solely to the picture plane, or can they also exist in represented space? Should they be seen as solid bars, perhaps tensile or compressed, or can they be viewed as channels for energetic direction and flow? A pictorial fact, or a vector having quantity and force? A static or a kinetic thing? All participants seemed agreed that, however ‘construction’ was to be defined, ‘no superfluous elements’ should be found in the constructed work – the words come from a Protocol issued by the group in March 1921.9 Rodchenko himself had entered the debate in a mood of obvious puzzlement. ‘We must … verify whether we can have true construction in painting’, he says, ‘rather than just an approximation’.10 But interestingly, he finally takes an ideological position, suggesting that just as organisation had created the Revolution, so organisation of the elements of art would produce ‘pure construction’. According to the Protocol, ‘the scheme of a construction is the combination of lines, and the planes and forms which they define; it is a system of forces’ – the words may even be his.11 That reference to ‘a system of forces’ indeed echoes the more pervasive language of force, direction and energy that permeates both Rodchenko and Popova’s published writings of the period, suggesting the organisation of energy at the level of the organism, the social collective, even of the state, of an order and rationality that could form the essential bond between avant-gardist politics and the work of art. Support for just such a hypothesis has been presented by Charlotte Douglas, who has proposed that two figures in particular, the Latvian chemist Wilhelm Ostwald and the Russian polymath Aleksandr Bogdanov, who were read widely in the years before and after 1917, might well have formed the background for this vital aspect of constructivist thought. Ostwald advocated a science of ‘energetics’ that would eventually explain and systematise the links between morality, economics, sociology and art; while Bogdanov’s concept of tektologiya or tectology propounded a theory of energy-transfer within dynamic organisms that he liked to call ‘a science of organisation’, or a ‘theory of systems’. 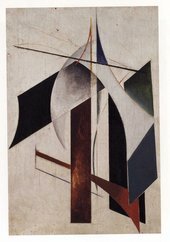 Bogdanov’s theory is often said to be the precursor of cybernetics.12 Popova for her part insisted that ‘energetics’ rather than ‘illusionism’ typified her series of Painterly Architectonics of 1918, an ‘energetics’ defined by the direction of planes and lines and colours in the work and that formed the basis of the work’s ‘construction’.13 In Popova’s subsequent Space-Force Constructions of 1920 and 1921, painted with thick paint on plywood, the running ‘bars’ can indeed be seen as energy channels that confine and organise the more inchoate swirling patterns that lie between them, and that they somehow harness – ‘space-force’ and ‘construction’ hence becoming inseparable and connected.14 ‘In Russia,’ she writes in December 1921, ‘as a result of social and political conditions that we are experiencing, organisation [she emphasises the word] has become the objective of the new synthesis … most attention will be given to making the artistic organisation of the object into the principle guiding the creation of even the most practical, everyday things.’15 Organisation in this statement has a metaphorical ring, but it also has the advantage of seeming to reconcile the conflicting practical pressures of surface design versus the depiction of illusory depth. Line or channel as a surface phenomenon could now express force and dynamism, rather than geometry alone. Such a formula seems to define linearity as at times static and at times kinetic, at times additive and at times disjunctive, at times abstract and at times depictive – both sides of the major binaries being traversed at will. And yet the sheer dominance of linearity in Rodchenko’s art in all the media has perhaps attracted less comment than it deserves. Art historian Christina Lodder has drawn attention to the fact that, in its practical application as much as in its artistic prototype, constructivism in the years after 1921 took on a certain predictable ‘look’ or linear ‘style’. Perhaps it is not only for reasons of utility, or efficiency, or cheapness, that the majority of Rodchenko’s designs for real objects employ an extremely simple vocabulary of wooden spars, hinged flaps, folding screens, collapsible struts – all of them highly efficient with respect to space as well as being generally applied to objects and spaces that had by the nature or their commission to be temporary. Lodder may be right in her assertion that the best of them were those made for the Workers’ Club at the Exposition internationale des arts décoratifs et industriels modernes in Paris in 1925.18 And yet in the longer process of retrospection it may seem odd that Rodchenko was never able to entertain the possibility of curved, or organic, or naturally asymmetric form. We may be looking here at the limits of Rodchenko’s innate competence, put powerfully to use in his remarkable graphic designs for posters, books and magazine covers that he completed throughout the 1920s, and on which his reputation remains completely secure. 1. M. Tupitsyn, ‘Against Kandinsky’, in Gegen Kandinsky/Against Kandinsky, exhibition catalogue, The Villa Stuck, Munich 2006, pp.138–72. 2. W. Kandinsky, ‘Little Articles on Big Questions: One Point: On Line’, Iskusstvo, Moscow 1919, translated in K. Lindsay and P. Vergo (eds. ), Kandinsky: Complete Writings on Art, vol. I: 1901–1921, London 1982, pp.421–7. 3. A. Rodchenko, ‘A Laboratory Passage Through the Art of Painting and Constructive-Spatial Forms Toward the Industrial Initiative of Constructivism’, in A. Lavrentiev (ed. ), Aleksandr Rodchenko: Experiments For the Future: Diaries, Essays, Letters, and Other Writings, Museum of Modern Art, New York 2005, p.131. 4. 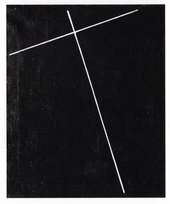 A. Rodchenko, ‘Notepad’, in Lavrentiev (ed. ), 2005, p.90. 5. Cited by A. Lavrentiev in ‘What is Linearism?’, The Great Utopia: The Russian and Soviet Avant-Garde 1915–1932, Solomon R. Guggenheim Museum, New York 1992, p.295. 6. An early recognition of the metaphorical dimension of Russian constructivism is B. Fer, ‘Metaphor and Modernity: Russian Constructivism’, Oxford Art Journal, vol.12, no.1, 1989, pp.14–30. 7. Lavrentiev tell us that the following books, at least, were in Rodchenko’s library between 1917 and 1920: S.H. Hinton, The Fourth Dimension and the New Era of Thought, 1904; M. Willkomm, Die Wunder des Mikroskops, 1856; C. Flammarion, L’Atmosphère, 1872 (published in Russia in 1910), C.A. Young, The Sun, 1910; and A. Zwart, Bausteine des Weltalls, Stuttgart 1913. Rodchenko was evidently fascinated by Georg Cantor’s uncountability theorem of 1873, which claims that the number of points on an infinite line is greater than the number of points on the line itself, hence that infinity comes in sizes (see Lavrentiev, ‘On Priorities and Patents’, in Magdalena Dabrowski, Peter Galassi, Leah Dickerman, Aleksandr Rodchenko, exhibition catalogue, Museum of Modern Art, New York, 1998, p.55). 8. M. Gough, The Artist As Producer: Russian Constructivism in Revolution, Berkeley, Los Angeles and London 2005, p.43, chapter 1, passim. The group agreed to submit paired drawings to resolve the issue. Those of the architect Nikolai Ladovskii show his own solution: ‘the main indication of construction [being] that in it there should be no excess material or elements’, whereas composition involves ‘hierarchy and co-ordination’. The sculptor Alexei Babichev proposed construction as showing how things could be built. 9. For the Working Group’s ‘Protocol’ of March 1921, see C. Lodder, Russian Constructivism, New Haven and London 1983, p.84. 11. And yet a definitive answer to his own question remained elusive, the more so since Rodchenko’s ‘Construction’ drawing for the debate has not survived. 12. Ostwald published thirty books in Russia, many of them extremely popular, between 1888 and 1913; while Bogdanov’s Tektologiya appeared in three volumes in 1913, 1917 and 1922. Bogdanov had Lunacharsky for a brother-in-law and was for a time close to Lenin through his advocacy of Proletkult, although the two eventually fell out. 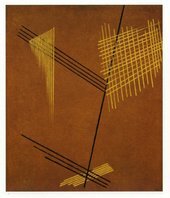 See C. Douglas, ‘A Lost Paradigm of Abstraction: Alexander Bogdanov and the Russian Avant-Garde’, in Y. Petrova (ed. ), The Russian Avant-Garde: Representation and Interpretation, St Petersburg, 2001, pp.203–1, and I. Lebedeva, ‘The Poetry of Science: Projectionism and Electroorganism’, in The Great Utopia: The Russian and Soviet Avant-Garde 1915–1932, exhibition catalogue, Solomon R. Guggenheim Museum, New York (passim). 13. L. Popova, Statement for the 10th State Exhibition of January 1919, in J. Bowlt, Russian Art of the Avant-Garde: Theory and Criticism, 1902–1932, London 1976 and 1988, pp.146, 157. 14. It is sometimes difficult – and must have been difficult for Popova – to decide which way the energy channel was flowing. There is a documentary photo of Space-Force Construction 1921 (Tretyakov Gallery Moscow) that shows it hanging the ‘wrong’ way up in Popova’s studio in 1924. See M. Tupitsyn (ed. ), Rodchenko and Popova: Defining Constructivism, exhibition catalogue, Tate Modern, London 2009, p.18. 15. L. Popova, ‘Commentary on Drawings’ (1921), in M. Tupitsyn (ed.) 2009, p.160. 16. A. Rodchenko, ‘Automonograph 1921–22’, MS, Rodchenko-Stepanova Archive, reproduced in Alexander Rodchenko: Constructions/Raumkonstruktionen, Ostfildern-Ruit, and Galerie Gmurzynska, Cologne 2002, p.103. 17. A. Rodchenko, ‘The Line’ (1921), translated in Art Into Life: Russian Constructivism 1914–1932, Seattle 1990, pp.72–3. 18. C. Lodder, ‘Russian Constructivist Design’, ibid., pp.137–8. 19. J. Bowlt, ‘The Construction of Space’, in Von der Fläche zum Raum / From Surface to Space: Russian 1916–24, Galerie Gmurzynska, Cologne 1974, pp.10–11. 20. E. Lebedeva, ‘Electroorganism and Projectionism’, in The Great Utopia,1992, p.442. 21. P. Galassi, ‘Rodchenko and Photography’s Revolution’, in Dabrowski et al, 1998, p.131. This article is based on a talk given at the study day Constructivism and the Art of Everyday Life, held at Tate Modern, London on 28 March 2009. Brandon Taylor is Professor Emeritus in History of Art at Southampton University and Senior Research Fellow in Modern Art at Southampton Solent University. Brandon Taylor, ‘Aleksandr Rodchenko’s Lines of Force’, in Tate Papers, no.12, Autumn 2009, https://www.tate.org.uk/research/publications/tate-papers/12/aleksandr-rodchenkos-lines-of-force, accessed 22 April 2019.